Walking into The Body Shop is like being transported back into my teen years. I (and every girl in the 90s) was OBSESSED with The Body Shop. For every Christmas and birthday you'd ask for (or give) products from there. I really adored their vanilla range (the small perfume oil bottle is adorable) as well as their White Musk and Dewberry perfume, which sadly has been discontinued. 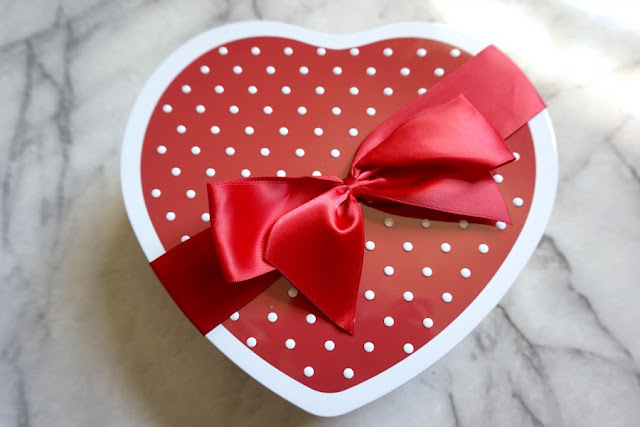 I was recently sent their "Strawberry Heart Tin" from Snip Snip, which is an online coupon code website. For those in Australia, you can use this site to find disounts on your favourite online stores like The Body Shop, Facial Co, L'Occitane, Ry.com.au and more. They also have discount codes for online fashion stores, homewares and even pet stores! Whenever I order online I always check out a brands facebook page to see if there's any discount codes but it's so handy having the one site that has multiple brands that I purchase from. Find your next online discount code here. Check out their Facebook page for new discounts too. In the (adorable) Strawberry Heart Tin, there are 4 products. 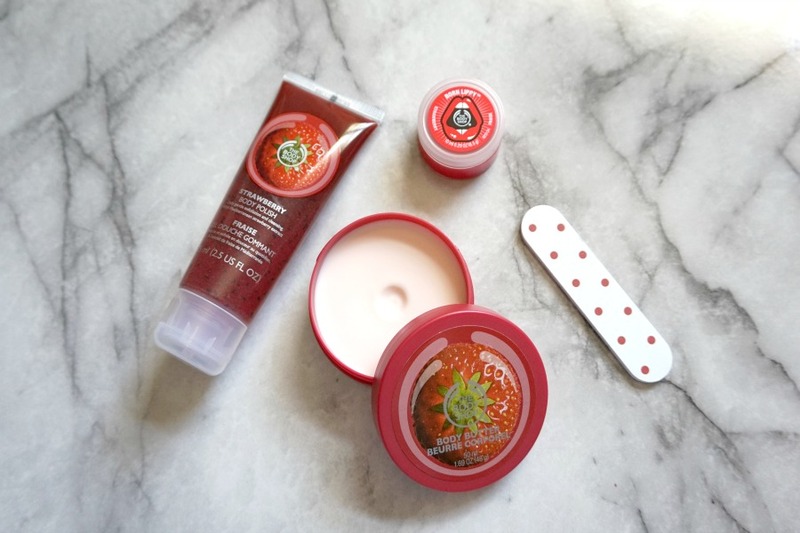 First is their cult body butter in Strawberry, which I used to adore especially in their tropical fragrances. Another cult product that I used to use is their lip balm pots, which I used to have hundreds of in my school bag. The product that surprised me the most was the Strawberry Body Polish. I'm a huge fan of salt and sugar body scrubs because they really exfoliate your body and leave you feeling silky smooth but this scrub is in a gel. I was worried when I first put it on my hands that it wouldn't have enough grit, but after using it I was really impressed. While it's not as rough as my usual body exfoliators, it still left my skin feeling soft and smooth. And it also comes with a cute mini nail file. I'm terrible with looking after my hands and nails, so this is a good reminder to look after them better. This pack is only $29.95 and is great value. 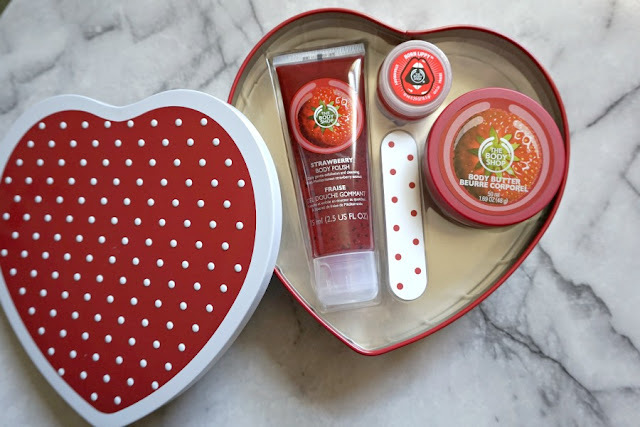 It would be perfect for a teen/tween or for anyone who loves The Body Shop. After using this, I've fallen back in love with TBS. I'm looking at making an order soon... what would you suggest buying from them? I'm thinking possibly the Spa Of The World Gift set or the Bowl Of Fruits gift set.